There’s no doubting it now: Netflix is bringing the ‘Gilmore Girls’ back to life, and we have the photos to prove it. 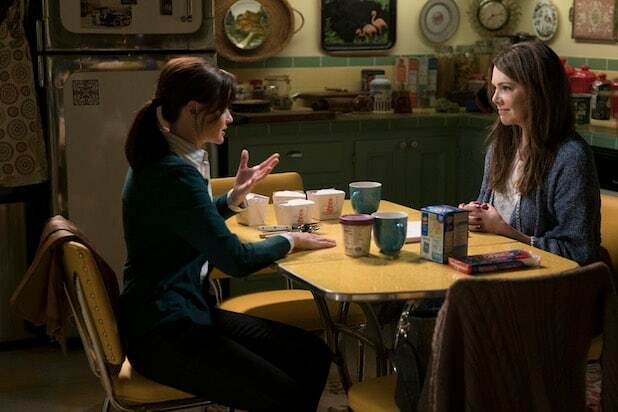 So where are the Gilmore girls nine years later? Seven first photos released by Netflix Monday are chocked with clues. Check them all out in the gallery below. Lorelei (Lauren Graham) and Luke (Scott Patterson) fans can rest easy — they’re together, holding hands happily in the new production. They’re even back to sitting aghast in Stars Hollow town meetings together again too. But the love lives of the other Gilmore girls are still a mystery. Though we see Rory (Alexis Bledel) is back in college, this time in front of the classroom (could she be anywhere but Yale? ), we don’t see any sign of Rory’s past love interests, even though Jess (Milo Ventigmilia), Dean (Jared Padelecki) and Logan (Matt Czuchry) are all returning. Kelly Bishop’s character Emily Gilmore will be approaching her character as a widow, after the death of actor Edward Herrmann, who played Emily’s husband. The photos show her in her Hartford home twice, once with Rory and once sitting alone. Also Read: Netflix Lovers, Are Your Monthly Fees About to Jump? The fictional town of Stars Hollow is up to its usual antics. Lorelei and Rory look ready for a ’60s time warp as Miss Patty and Babette scout for stars for the town musical. Miss Patty’s still hosts the town meetings. Lorelei and Rory’s diets are still relying heavily on take-out. Did Friday night dinners have continued all these years? One picture shows Rory and Emily gathered at the drinks cart in Emily’s Hartford, Conn., home. “Gilmore Girls” on Netflix is produced by Dorothy Parker Drank Here Productions in association with Warner Bros. Television.